In the beginning, Fate Testarossa was merely a 9-year old girl who pushed herself to extreme lengths to satisfy her mother's demands. Despite dealing with being disciplined and tortured for her insufficient progress, Fate never complained as she continued gathering Jewel Seeds, fighting female lead Nanoha Takamachi, who was also collecting them. As the days passed, Nanoha's words and feelings burrowed into Fate's heart, ultimately reaching her when Nanoha's colossal firepower broke through her defences. After the incident was over, Fate learned to move on from the truth (see season 1 for how it ended). During her court trial period, she kept in touch with Nanoha and got to know her friends. She atoned for her sins by joining the Time-Space Administrative Bureau (TSAB) as an Enforcer. When she was stationed on Earth for the Book of Darkness case, she fit in quickly with Nanoha's group of friends. Staying with her commanding officer's family, she got to taste the joys of being a young girl for the first time in her life. 10 years have passed since those days. 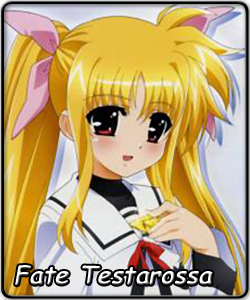 After growing up on Earth, Fate now lives together with Nanoha in the capital city of the TSAB. As a magical woman (she still has a Henshin scene), she balances her Enforcer/Detective job with caring for a lot of children that she's saved over the years, motivated by how she herself was saved by warm hands. Two of her adopted children now serve in her squad as frontline Forwards. Being a career woman, she can't stay at home all the time and is often seen driving her black car around the city. When she does find time, she helps out with the training of her children in her squad. Perhaps in the back of her mind, she was searching for other jewels - the ones embedded in a Saimoe crown. Fate got off to a rocky start in 2005, losing to Rozen Maiden's Shinku in her first round by only 18, thus beginning the greatest title series rivalry in Saimoe history. She then joined her friend and eventual 2005 Saimoe Japan champion Nanoha Takamichi in the newly formed 2006 Saimoe Circuit. However, she was knocked out of Korea Best Moe early, so she turned her full attention to Japan. After an easy first and second round, Fate found her first competition in the round of 32 matchup against Rena Ryuguu (Higurashi no Naku Koro Ni), in which she barely escaped by only 73 votes. Her next matchup was a fateful one, as she was pitted against Nanoha herself. However, with Nanoha already having a championship in possession, Fate was guaranteed to head into the elite eight. After a momentum serving victory, Fate carried that momentum by crushing Eruruu (Utawarerumono) and Chikaru Minamoto by three-digit margins. However, her momentum would fail her in the finals. A meeting with 2006 Saimoé sensation Suiseiseki (Rozen Maiden) concluded in a 76 vote loss. Failing to deliver a second crown to the Nanoha series, Fate returned to the competition in 2007. She entered Saimoe Japan 2007 as a favorite, but "fate" took the other direction, as a random pairing error pit Fate against Suigintou (Rozen Maiden) in the second round. In what was the highest vote total in the history of Saimoe Japan's second round, Fate lost by only 166 votes. She had a more successful run in Korea where she literally dominated the competition (at least in her bracket) and setting a record by winning her round of 32 match by 993 votes, only 7 away from a four-digit marigin. Her top 16 matchup featured a rematch with Suigintou, in which she won comfortably by 443. However, in a rematch of the 2006 Japan finals, Fate lost to Suiseiseki in the round of 8, ironically by only 7 votes. In the invitational Korea's Super Best Moe, after a dominating performance in the preliminaries, Fate was shut down by Yuki Nagato (Suzumiya Haruhi no Yutsuu) in the round of 16 by 33. Fate will be returning for what could be her final year in the standard Saimoé circuit. Without knowing whether the Nanoha legion has disbanded or not, Fate comes to International Saimoe League 2008 with nothing to lose, and everything to gain. All of her opponents she has lost to are in this tournament, as well as many other powerful contestants, yet Fate will continue to press forward for her first Saimoé tiara.